Team Angels Wings will take part in this years Hawaiian Walk for Women’s Cancer. Front: Lisa Antunes, Denise Mueller, Melanie Garces Joanne Da Silva and Teresa Silva. Back: Connie Mascarenhas, Marilyn Pratt, Suzy Loreto and Lilia Da Silva. 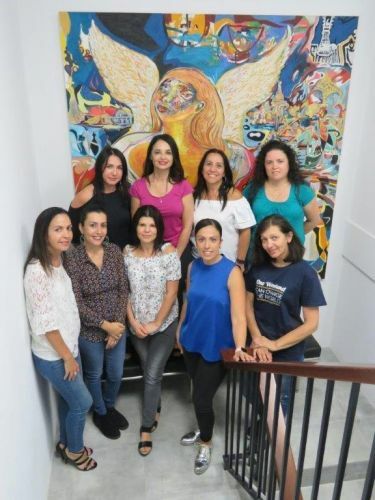 A GROUP of “angels” will don their walking shoes and walk up to 42km as part of Hawaiian Walk for Women’s Cancer on Saturday May 5. Team Angels Wings headed up by South Fremantle resident Joanne Da Silva and 16 women hailing from the cities of Cockburn, Fremantle and Melville have raised more than more than $100,000 for the Harry Perkins Institute of Medical Research and thousands of dollars for the Cure Brain Cancer Foundation and the Fremantle Foundation’s Impact 100. Mrs Da Silva said the group of 17 originally came together as a way of bringing about change to things dear to their heart. “Cancer was one thing that had affected all of our lives in some way,” she said. “Over the last few years, we are proud to say we have raised well over $100,000 towards the research of a variety of women’s cancers and with the current fundraising will get close to $150,000. The mother-of-two said the group was planning to hold more fundraising events including a sundowner for the Cure Brain Cancer Foundation this year, and believed it was important to give back to the community. “We all believe in the importance of giving back to the community and we’re proud to use our time and influence to make a difference to those in need,” she said. “All our efforts haven’t been alone and we have been fortunate to have some amazing sponsors including Scoop Property and Finance, PrimeWest and Homestyle foods companies who have supported and assisted us in achieving our fundraising goals. “Cancer doesn’t stop and with another four close friends being diagnosed with breast cancer. The group hopes to raise $12,000 as part of this year’s walk.